It's soup season! 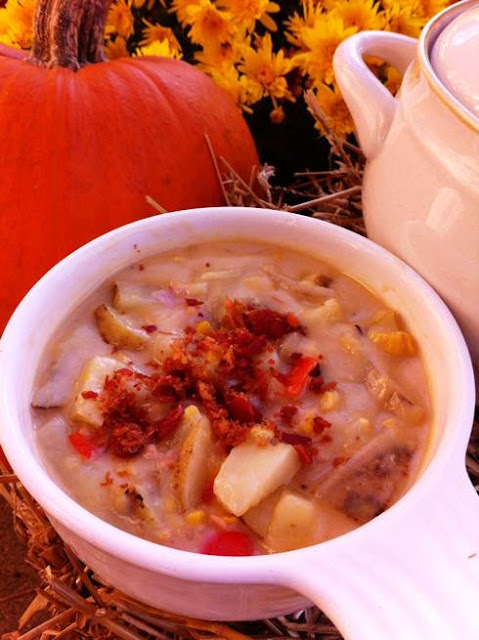 This Potato Corn Chowder is a tasty, hearty and easy to prepare soup you can add as a side to your Thanksgiving dinner. Discover the comfort inside "The Best Potato Corn Chowder," in my opinion! 1. Cut potatoes and ham into 1/2-inch cubes; set aside. Dice bell pepper and chop celery. Heat butter in a Dutch Oven or 3 Qt saucepan over medium heat. Add bell pepper and celery; cook and stir 3-4 minutes or until vegetables are crisp-tender. Stir in flour; heat until bubbly. Gradually add broth, evaporated milk and corn, whisking until blended. 2. Add potatoes; bring to a boil. Reduce heat; cook, uncovered, 10 minutes or until potatoes are tender. Stir in ham; heat through. Remove from heat; season with salt and black pepper. 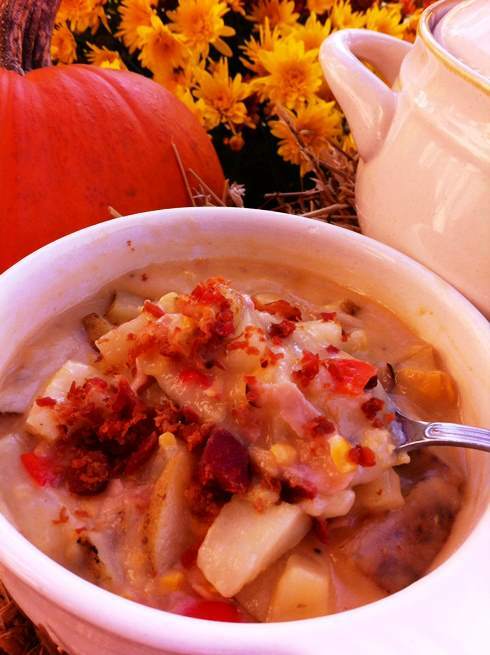 Ladle soup into bowls top with crumbled bacon, if desired. Another idea, is to have it as a side with your after Thanksgiving turkey sandwiches. The creaminess along with the chunks of potato and corn are flavorful together and satisfy any hungry uncle you might have visiting for the holiday. Here's wishing you a joyful Thanksgiving Day! Yummm. I'm all about soups, chowders, especially potato recipes. This looks delicious! Warm and wonderful. And great with turkey leftovers! oh gosh that looks good!